Until the advent of Kinman’s Gen-2 technology there was no way to get a Tele neck pickup loud enough to balance with a Bridge Blaster, the loudest bridge pickup Kinman make and one that balances with a neck P-90 or Humbucker. 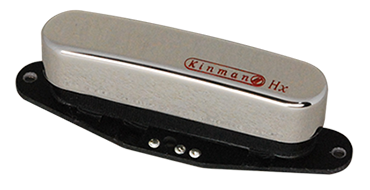 But all that’s changed now and after years of R&D Kinman finally did it with this remarkable new Gen-2 great sounding neck pickup. Gen-2 is generation two, a new design utilizing Patented magnetic focusing device that increases the efficiency of the coil. Normally, sonic quality and character are sacrificed in order to achieve high output. But the remarkable Gen-2 technology produces a sound with a good degree of piano mid-tones, the hallmark of quality, from the small Tele neck model. The sonic performance is upheld by a NEW Gen-2 Nickel-Silver cover which is engineered to look like the original but not impact in a negative way on the sonic performance of the pickup as the original 60's Fender Chromed Brass covers do. The cover is also arched to allow staggered magnets which produce much improved string volume balance. Also the cover does not produce buzz when touched with fingers. Available in 3 finishes, Chrome plated, Gold plated and buffed un-plated Nickel-Silver that will age fast for a relic look. To kill the hum without killing the tone and preserve the original appearance has taken nothing less than a technological revolution. This pickup has Kinman's propriety Alnico low strength magnets, like all our Fender type pickups, so string pull is minimized, sustain is longer and there is less rattle and buzz from the strings crashing into the frets from excessive magnet pull. Connection: prepared bare wires for soldering, cut generously longer than necessary for Telecasters. 3 conductor shielded cable (OK for series connection of 4 pos switch -and- phase reversible -and- compatible with Fender's S1 harness). Pot & Capacitor values: Plenty bright enough with a 250k volume pot. Might be too bright with less punch in Teles with 1Meg or 500k pots. Tone pot is usually the same value as the volume but for a little more top end brightness can be 500k, 1meg or a No-Load. Stock pots can actually measure as low as 175k. Pots in our Goodbye-Soldering Harness are guaranteed to measure no less that 250k. Normal tone cap value of 0.022uF in 63 ~ 100 volt Polyester. Smaller value reduces the severity of Treble cut, larger values increase it. Magnet spread: Standard 50mm only. Magnet Staggers Improved Stagger to suit 7 ~ 14 inch uniform radius fretboards including USA Custom Guitar Compound 7-1/4" ~ 9-1/2 Mounting hardware included 2 Pan head mounting screws 6-32 x 21mm UNC interim (4-40 x 21mm UNC coming soon) 2 Silicon Rubber tube springs. Cover: NEW electro-Chrome or Gold plated Nickel-Silver cover for extended durability and zero impact on sonic performance. Matching mounting screws. Arched top to accommodate staggered magnets for perfect string volume balance.